Anxiety can generally be defined as a response to a threat that causes nervousness and fear. In extreme cases, anxiety can have impacts on daily life and can be characterized by different symptoms for example panic attacks. For example, the light/dark paradigm is based on a conflict between the innate aversion to brightly illuminated areas and the spontaneous exploratory activity. The elevated plus maze (EPM) test is used to evaluate the relative anxiety status of mice or rats. The EPM situation rests on the conflict between the innate tendencies of rodents to explore novel environments and avoid open and brightly lit areas. 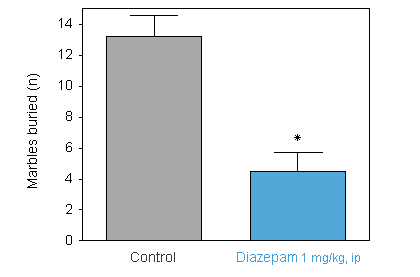 MICE : 1 mg/kg diazepam induces a significant increase in the time spent in the open arms. RATS : 1 mg/kg diazepam induces a significant increase in the time spent in the open arms. 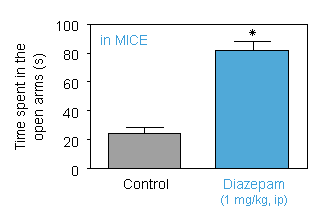 The light dark (LD) test is used to evaluate the relative anxiety status of mice. The light dark paradigm in mice is based on a conflict between the innate aversion to brightly illuminated areas and the spontaneous exploratory activity. If given a choice between a large brightly compartment versus a small dark compartment, mice spontaneously prefer the dark. 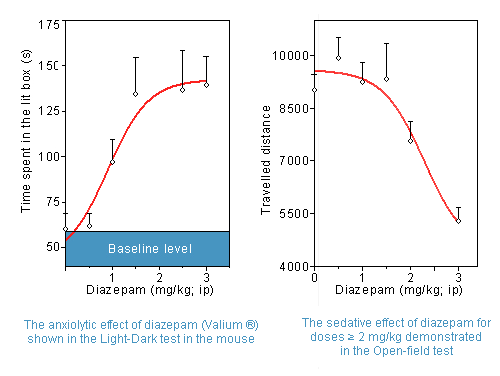 Diazepam produces a dose-dependent reduction of time spent in the lit box, suggesting an anxiolytic effect. which suggests a sedative effect at doses higher than 2 mg/kg. The Marble Burying test is used to record the number of marbles buried by mice placed in a novel environment. This test has some predictive value for anti-depressant and/or anxiolytic drugs. 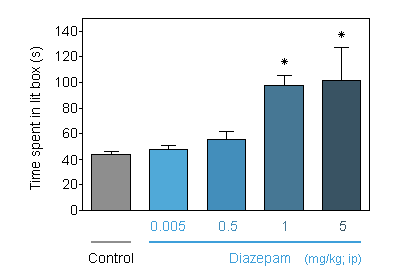 1 mg/kg diazepam significantly reduces the number of buried marbles in mice. PANIC ANXIETY : the EPM test is used to evaluate the relative anxiety status of mice or rats. The MB test is used to record the number of marbles buried by mice placed in a novel environment.